The Ahmadiyya Muslim Community USA, established in 1920, is the first and oldest Muslim organization in the United States. 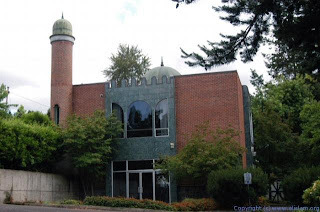 The Portland chapter of the Ahmadiyya Muslim Community was established in 1966 and built the Portland Rizwan Mosque - the first Mosque built in Portland - in 1987. 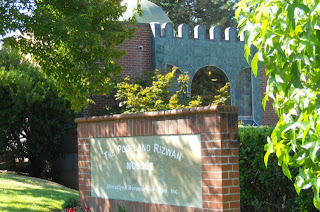 The Portland Rizwan Mosque stands on a hill in a quiet residential neighborhood in Southwest Portland. The design of the mosque is a fusion of traditional architectural elements of mosques in Muslim-majority countries and American suburban architecture by which it is surrounded. 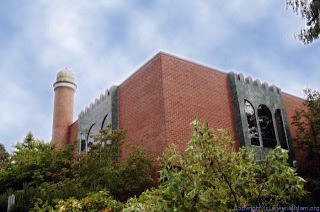 The small mosque displays a 40-foot decorative minaret that faces the street, while large glass doors placed within wall-length windows provide a beautiful entrance from the front parking lot. During its entire history, the Portland chapter of the Ahmadiyya Muslim Community has been a source of Islamic knowledge in Portland and has played an active role in outreach and interfaith programs. Comprised of members from various ethnic and national backgrounds, it has been a beacon of pluralism and rational discourse. It organizes classes and social events, as well as community service activities such as blood drives, adopt-a-highway cleanups and food and clothing drives. 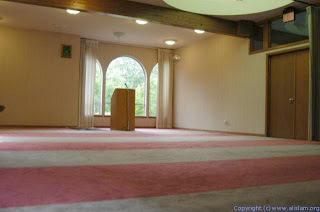 It also opens its doors to classes, religious organizations and other individuals and groups desiring to visit a mosque and/or learn about Islam.